On the surface, this week’s selection of Blu-rays may not look like much, but there’s something here for everyone, including the latest from Seth Rogen, the debut of a couple cult classics, and a few box sets that most movie nerds already have on their radar. There may not be any really major titles being released today, but I’d much rather have the option to choose from a solid list like this any day of the week. A curious mix between “Paul Blart: Mall Cop” and “Taxi Driver,” Jody Hill’s sophomore effort isn’t the usual Seth Rogen laugh-a-thon, but rather a pitch-black comedy that only gets darker and more sadistic with each passing minute. This is the kind of film that usually divides moviegoers, and though I didn’t love it or hate it, I will admit that it’s Rogen’s strongest (and most mature) performance to date. It usually takes a while for a comic actor to branch off into more serious roles, but Rogen has been so overexposed lately that it’s nice to see him try something new. 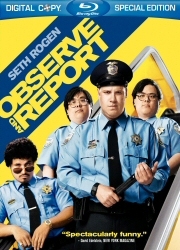 “Observe and Report” is hardly the kind of film that benefits from high definition, however, so Warner Bros. has made a point of distinguishing the Blu-ray edition from its DVD counterpart by making all of the extras – like a picture-in-picture commentary, deleted scenes and a gag reel – exclusive to this release. It isn’t exactly the smartest business practice, but HD fans won’t complain. At least we’re finally getting a little extra bang for our buck. People may think of Tim Burton when they hear the words “stop motion animation,” but for my money, Nick Park is the king of the genre. His “Wallace & Gromit” shorts have earned a nice little following over the years, and though the feature-length “Curse of the Were-Rabbit” failed to take the franchise to the next level, it’s still a darned good film in its own right. Still, Park’s bread and butter (or crackers and cheese, if you will) has always been the shorts, and along with collecting his three previous films (“A Grand Day Out,” “The Wrong Trousers” and “A Close Shave”), the new compilation also features Wallace and Gromit’s latest madcap adventure, “A Matter of Loaf and Death.” To sweeten the pot, Lionsgate has also included a bevy of bonus material like commentary tracks, making-of featurettes and a hilarious episode of “Shaun the Sheep.” At only $20 bucks for the Blu-ray edition, it’s hard to imagine even the most casual fan not succumbing to such a great deal.